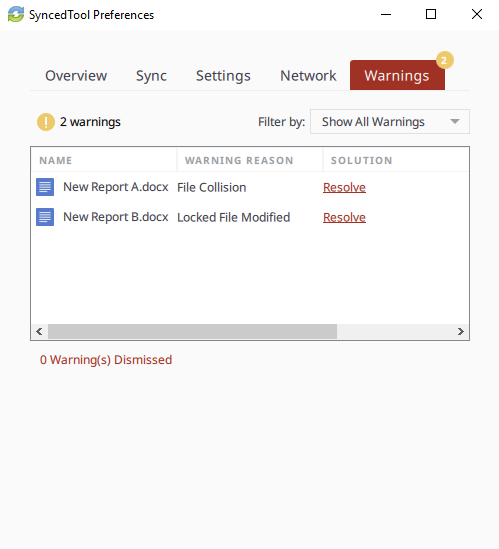 The desktop client generates file sync warnings to alert end users of potential problems with the file sync process. Each warning provides an automated resolution option. Best Practice: While end users are primarily responsible for viewing and resolving their own warnings, you can help them monitor these important events. Anchor logs various file sync warnings--including both collision and collision resolution events--and these events are viewable in the Windows Event Viewer dialog box and the OS X Console utility. For more information, please reference the How to Track Anchor Collision and Collision Resolution Events Knowledgebase article. Note: On a Windows machine, the icon is located in the lower right-hand corner of the screen; on a Mac machine, the icon is located in the upper right-hand corner of the screen. The Preferences dialog box displays, showing the Warnings tab. Click the Rename button to rename your copy to include the term collision appended to the end. When this option is selected, you will see two files: the original_file_name file and the original_file_name (collision) file. Click the Discard button to discard your copy without saving changes. If the Allow Users to Overwrite Collisions policy has been configured for the organization, you can also click the Overwrite Current button to sync your local copy as the current server version. The following tables outline file sync warning messages and provide options for how to resolve each issue. Warning: This file deletion won't sync to the cloud because you don't have permission to delete this content. You do not have permission to delete this file. To resolve this warning, click the Restore option to restore the deleted file. Warning: This folder deletion won't sync to the cloud because you don't have permission to delete this content. You do not have permission to delete this folder. To resolve this warning, click the Restore option to restore the deleted folder. 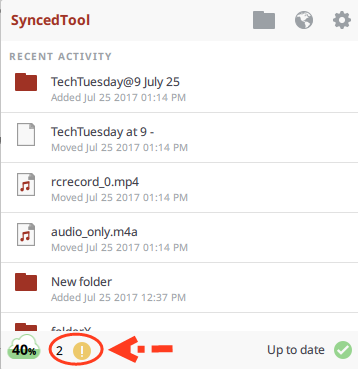 Warning: This file move operation won't sync to the cloud because you don't have permission to move content from the original location, and/or into the new location. You do not have permission to move this file. To resolve this warning, click the Revert option to restore the moved file. Warning: This folder move operation won't sync to the cloud because you don't have permission to move content from the original location, and/or into the new location. You do not have permission to move this folder. To resolve this warning, click the Restore option to restore the moved folder. This new file won't sync to the cloud because you don't have permission to create files in this folder. You do not have this permission to create files. To resolve this warning, click the Delete option to delete the newly created file. Warning: This new folder won't sync to the cloud because you don't have permission to create folders in this location. You do not have permission to create folders. To resolve this warning, click the Delete option to delete the newly created folder. Warning: The new changes won't sync to the cloud because you don't have permission to edit. New changes from the cloud won't sync down either. You do not have permission to edit the file. To resolve this warning, click the Discard option to remove changes to the file. Warning: This file isn't syncing because the local changes are conflicting with the cloud version. Rename - Rename the local file so the new changes sync to the cloud. This creates a new file. Discard - Discard the new changes and sync down the cloud version. This option will send your recent local changes to the Recycle Bin. Overview - Overwrite the cloud version with the new changes. Note: This option will only be visible if it the Allow users to overwrite collisions policy is enabled. Warning: This folder isn't syncing because a folder with the same name already exists in the cloud. Rename - Rename the local folder to begin syncing to the cloud. This creates a new folder. Delete - Delete this folder and sync down the cloud version. Your local folder will be sent to the recycle bin. Warning: There is a problem connecting to this folder. You can try updating your credentials to regain access. Your credential are incorrect. After clicking Enter Credentials, the you will be prompted to log in. Warning: The new changes won't sync because the file has been locked. You are attempting to edit a locked file. This error will resolve itself when the file is unlocked. Warning: This folder isn't syncing because it could not be found. Folder was actually deleted or never created. Not able to access the drive itself (for example, the folder is located on a flash drive or network share). Unsubscribe - this option will unsubscribe the user from the Team Share. Re-Sync - this option will re-sync this data from the cloud.